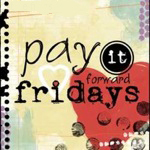 It is Pay It Forward Fridays again!!!! You guys know the drill...go out into the world and Pay it Forward, then come back here and share it with us :) And while you're at it, come on over to the Blue Frogs Legs Community, and join in on the discussions. Because I believe the world is full of amazing people, and we should celebrate the amazing things that people are doing. Let's celebrate the positive stuff!!! Leave a comment below on how you Paid it Forward! Don't forget to grab my Pay it Forward button on the right hand side. Thanks for this blog hop! I love it!!! Thanx for participating Mrs. Claus, and I love your blog!!! Thanx Toni, spread the love! Hi! I'm new to your blog...I found you on the blogfrog communities. I love this idea of paying it forward. The number at the end of that video is staggering. I hope to be able to contribute to this in the future! Wouldn't that be great!! BUt it takes small steps to go on a long journey, and if we all put in a few small steps, the journey could be phenominal!!!! How incredible, inspiring, and very compelling. Thank you! I'm on board. My girls and I are going to make some "You Are Loved" fairies and are going to leave them in random places around town. I love this, and love how much you get your daughter involved as well. Peace. I will be posting this tonight, but here is a preview...Also, I started on Friday (how neat is that?!). I just found out that my grandmother, whom I am going to see on Monday, has been undergoing chemotherapy. She didn't want to tell me because she wanted my visit to be fun. She wanted to just enjoy her greatgrand children. She mentioned she was cold during chemo and I instantly decided to make her a quilt. I somehow put a quilt together, quilted it and finished it in two days so I could give it to her while we are in town. It's a gift that I know she will love and that will lift her spirits during the days ahead.